Content is king! Like most clichés, it’s repeated so often because it’s true. There’s no better way to develop and audience through content. Fortunately, content can be an incredibly powerful tool for that too. 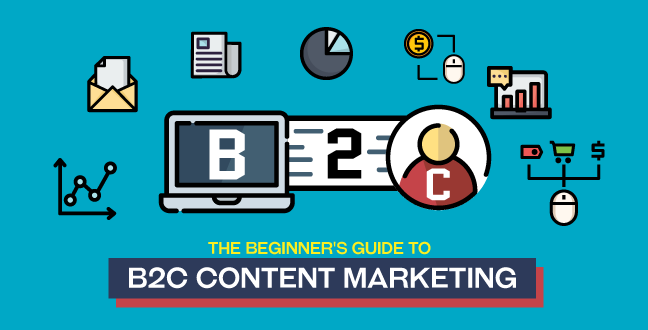 Business To Consumer, which is also known as B2C content marketing, when it’s done well, follows a series of methods and best content marketing practices that enable you to promote products through useful, engaging, high-quality content. Is there a business in your niche that’s outperforming you in sales? Chances are it’s because of their B2C content marketing. 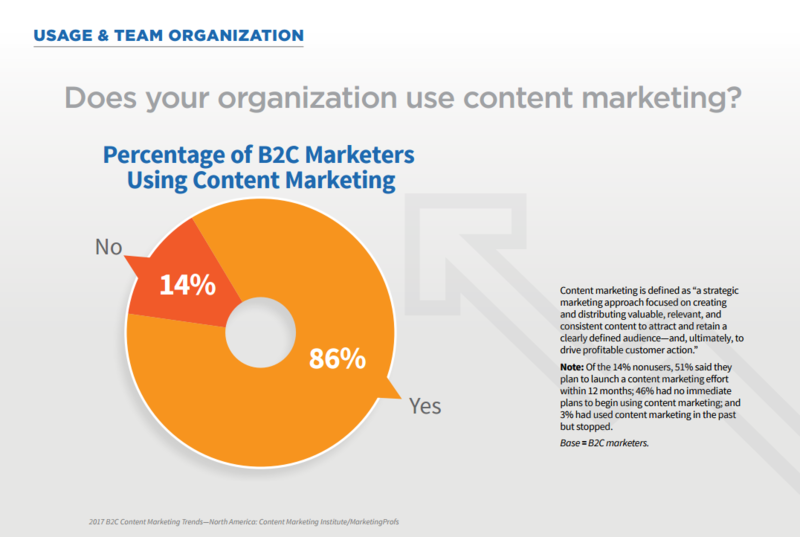 From the research for B2C content marketing, 49% of businesses have a small or one-man content marketing team serving the entire organization. As a result, only 21% of businesses would categorize their B2C content marketing as very successful, while 45% said moderately successful. Only 3% said they had seen no success at all. So it’s clear that B2C content marketing success is not binary – there’s a spectrum of success for every business. 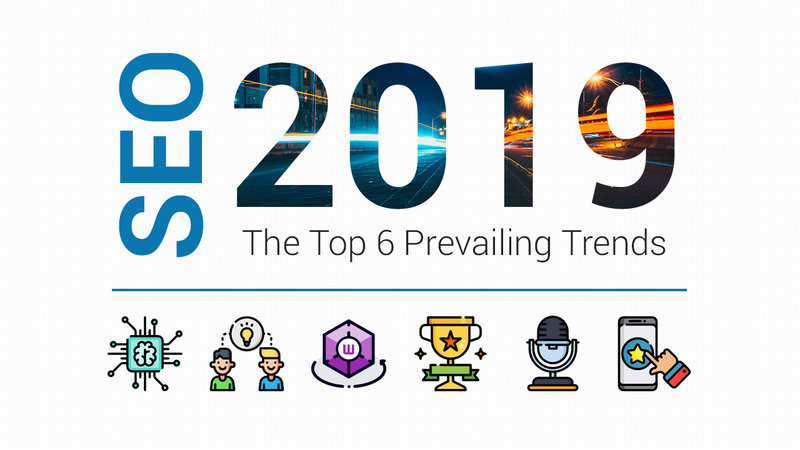 Today, we’re going to look at some of the fundamentals that will put your business on the road to being in that top 21% of businesses experiencing strong success through B2C content marketing. You can use B2C content marketing to improve your organic traffic, increase your exposure with your target audience, and enhance brand awareness across multiple touch points. Slow down. Their B2C content marketing is what MADE them cool and exciting in the first place. One is a camera and another one is an energy drink. They could have gone in very different directions with their brands – but they both anchored themselves to a lifestyle. 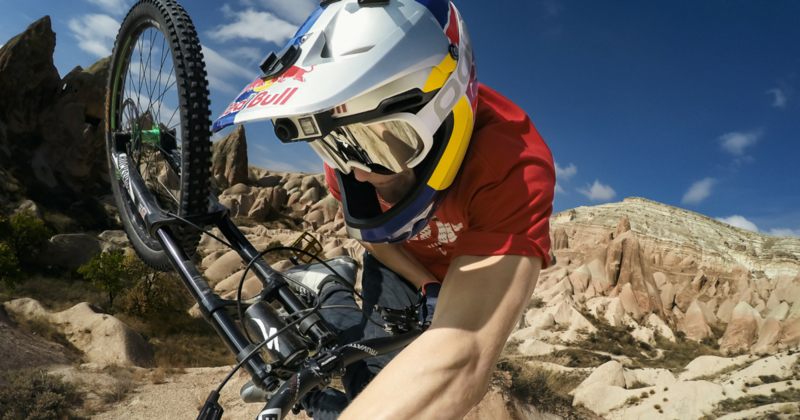 What does it mean to be a Red Bull or Go Pro user? To answer that question, the companies each created highly visual, cross-channel content. They associated themselves with aspirational activities on the frontiers of human capability: extreme sports, adventure, parachuting to earth from space. Of course, these brands could rely on high-profile endorsements to deliver serious ROI. But the principles are just as useful to you. They built their brands and kept them top of mind with consumers by being aspirational. They targeted a specific market and diversified content that would appeal to target audiences within that market. And everything they did was emblazoned with the logo, the colors, the whole brand identity. 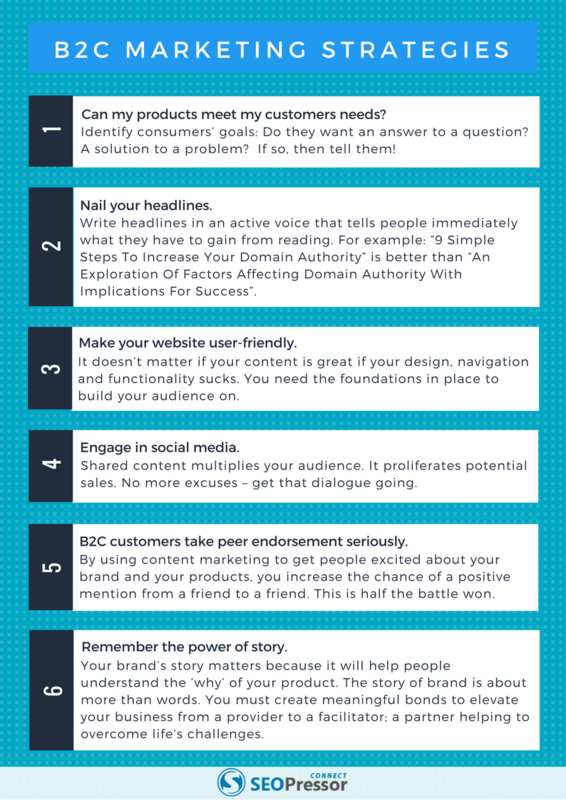 So here are the best B2C content marketing practice tips. So the best practice tip here is to brand your content. If you make amazing content but no one knows it’s yours, you aren’t going to benefit from making it. Diversify your content. Blogs. Articles. How To’s. Videos. Interviews. Adverts. Campaigns. Put yourself at the center. What connects the different buyer personas, the different applications, the different lifestyles and values, the different budgets of all your customers? You. If you have high profile customers, big them up and your low-profile ones will feel connected to them through you. Google is not a treasure map. It doesn’t guide people to where the most value is. It takes them where they want to go. The X that marks the spot moves depending on what spot people want to go to. Your job is to be on that spot when people decide they want to go there. Buffer understand this, and their content creates a massive impact on their company financials as a result. They became one of the best B2C content marketing examples by utilizing Keywords. This is what users enter when searching for products, services or information. Google wants you to do your best work with keywords, as this creates the best search results for users. They’ve created a Keyword Planner. 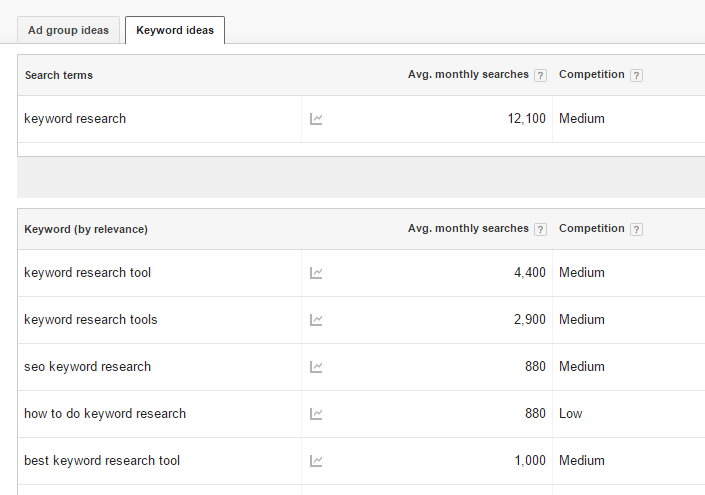 The Keyword Planner allows you to enter a keyword related to your product or service. You can then hit ‘Get Ideas’ to see what users are searching for around that topic area. By creating content that addresses these searches, you’re placing yourself on the X of the treasure map. People will discover you as the answer to their problem. Don’t try and reinvent the wheel. No one is out there looking for a better alternative to the wheel. You’ll distinguish yourself from your competitors through several factors. Quality. Have content that is written to a high standard, free from typos. Depth. Have original research that offers fact-based insights, or collate data in new ways to offer original perspectives. Perspective. Having a tone of voice that meshes with your customers’ own natural way of speaking, and seeing things from a point of view that matches theirs, will you feel like ‘one of them’. It removes any kind of top-down relationship of a big business trying to manipulate someone into buying, and turns it into a friendly recommendation. In transactional and e-commerce environments, you can focus your marketing efforts on giving people all the information they need to make a purchase, and nothing more. 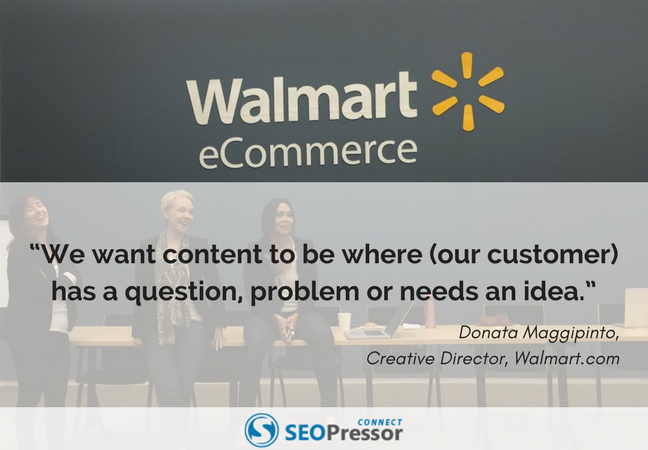 Brands like Walmart creates a diverse array of content like anyone else. But what they also do is make everything, and I mean everything, sales oriented. There’s a call-to-action (CTA), an incentive, a clear assertion of value in everything they put out there. They aim to highlight the advantages of their product or service in innumerable different ways. That way, whenever people finish with a piece of content, they are reminded that the answer they were searching for is readily available from the brand. This is a far more aggressive strategy of B2C content marketing than Red Bull or Go Pro’s brand building efforts, which uses aspiration to create a kind of sub-conscious soft-sell. Make your content product-driven. If you’re looking to sell a piece of content, the content can be about how the product solves a problem for a consumer. Emphasize value. Value isn’t price. If something is cheap but useless, it has low value. If it’s expensive but really useful, it has moderate value. If it’s affordable and really useful, it has great value. Value is a cost benefit analysis. You want to perform that analysis subconsciously for your readers to maximize the perceived value of the product. Appeal to emotion. Emotion is imperative. It bypasses the rational mind and feeds our impulses. It is much more powerful, and therefore will more likely result in an action. If your product can mirror that journey (“this magnetic screwdriver means no more losing screws!” or “People will love your new look thanks to this hair dye!”) you will increase your success. Social media is a powerful way to augment your B2C content marketing strategy. Grammarly is a great example. 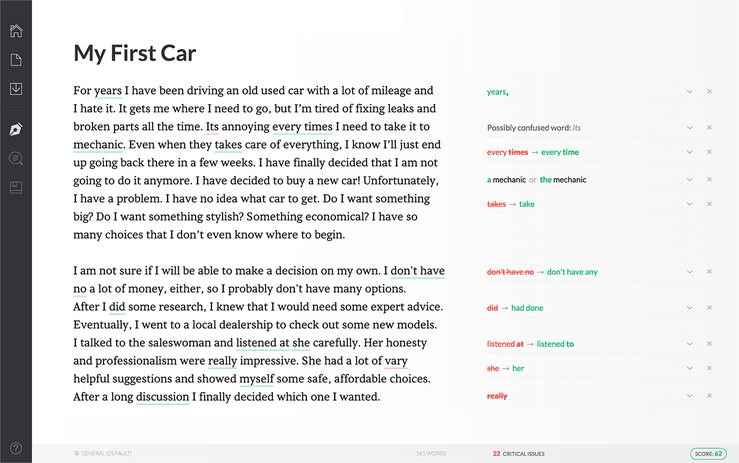 Grammarly utilizes multiple strategies simultaneously. They create comedic definitions for common words that appeal to creative writers. They investigate common grammar and spelling debates. Best of all, they also have a WordPress plug-in. It’s simple, it’s easy, and it generates discussion from people who are passionate about the subject. Social media can be invaluable in creating a feedback process with your customers, and this shouldn’t be underestimated. Deloitte University Press performed some research to see what actually influences consumers buying decision. 81% of shoppers said they were important. Using B2C content marketing to encourage feedback, especially positive feedback for your products from existing customers, whether through Facebook, Email or on your website, can help you encourage positive reviews and in turn, positively impact sales. You can challenge your audience by creating a debate (like how we did it here on SEO VS. PPC). So much content emphasizes providing answers, but you can ask more difficult questions of your audience to get them actively engaged. Just make sure you reward those who take part. For example, you could use social media to offer free shipping on future orders in exchange for a review (most consumers have left less than ten reviews in their lifetime, and prefer free shipping to discounts). So, to summarize what we’ve learned from our overview of B2C marketing strategies, let’s finish with a checklist you can use to make sure your budding strategy is well optimized. With these factors in mind, you can begin to do B2C content marketing work that will not just benefit you, but your customers. Your ultimate aim is to create a positive feedback loop that allows you and your audience to increase in prosperity and happiness, together. Now that you’ve understood about B2C content marketing, head over to Azfar’s post to learn about C2C E-Commerce To Stand Out From The Crowd. Think there’s anything I’ve missed? Call me out in the comments below! Alternatively, share your inspiring story of how you’ve found success from B2C content marketing with our other readers. If you think honest marketing is nothing more than shooting yourself in the foot, here's 5 proof to show you How Honest Marketing Give Businesses Real Results! 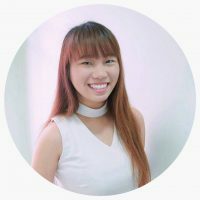 Joanne is an aspiring copywriter with an obsession for SEO. Curiosity is her motivation, love and life are her inspiration. She also enjoys reading fiction and contemporary as much as mac and cheese.